Evangelist Reinhard Bonnke, Founder of Christ for all Nations (CfaN) will return to Nigeria for a five-day crusade which will mark his final African Gospel – Crusade in November 2017. While certainly not CfaN’s final African crusade, Evangelist Bonnke’s return could inspire another historic global attendance as that of the Lagos, Nigeria Millennium Crusade in 2000, CfaN’s largest crusade to-date. The crusade according to its organisers is a mission to making Nigeria and Africa a better place. Christ for All Nation (CfaN), says it aims to reach out to more than 30 million Nigerians with the gospel with at least 10 million people attending the crusade every day and submitting to the majesty of the gospel of Jesus Christ. At this conference, hundreds of thousands of willing ministers of God in Africa are expected to literally catch the Reinhard Bonnke’s Fire For Greater Exploits. Bonnke’s choice of Nigeria to stage the final lap of his large-scale global evangelism outreach is God-ordained and, therefore, it will be explosive. Also ministry alongside Bonnke at the crusade will be Daniel Kolenda, his successor and current president of CfaN. John Darku, the CfaN’s African Director, shared that this crusade will be like none we have seen before. He said they are currently planning to recruit 500,000 counsellors, 200,000 intercessors, a choir of over 23,000 and a security force of over 10,000. CfaN says it expects a spectacular harvest of souls for Christ our Lord Jesus at the crusade. 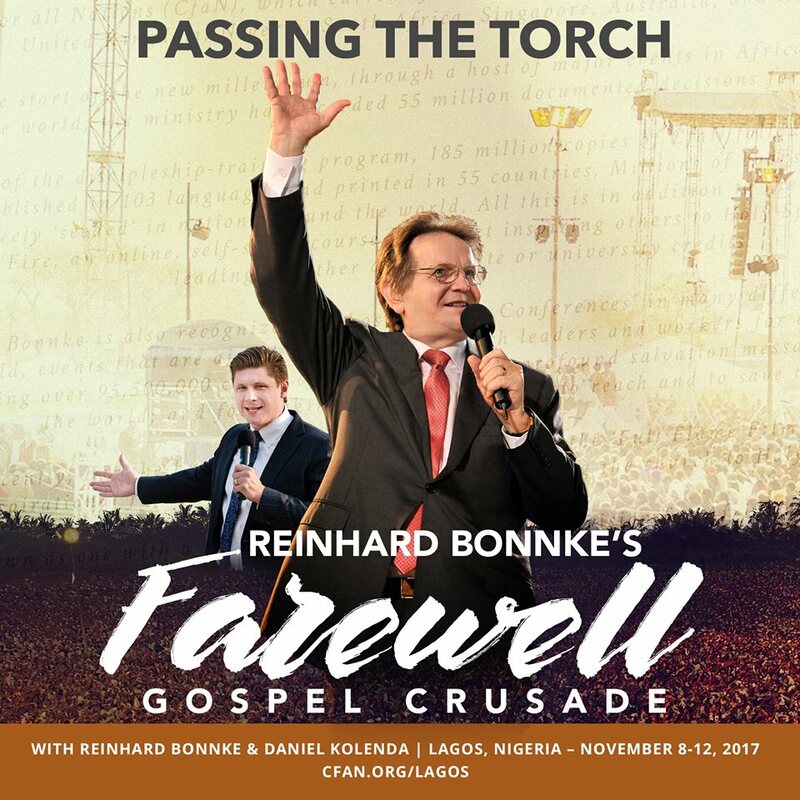 Evangelist Reinhard Bonnke says his Farewell Crusade is going to be tremendously ANOINTED and POWERFUL. Get ready as he PASSES THE BURNING TORCH.